﻿﻿ 沙漠部队（sandtroopers） - Databank - 星球大战中文网 Star Wars China - Powered by Discuz! The sandtrooper is a desert terrain stormtrooper equipped with modified armor and gear to better withstand missions in harsh, arid locales like Tatooine. While their armor is superficially similar to that of the standard stormtrooper, advanced cooling systems in both their helmets and suits offer these troopers protection from the relentless heat. Sandtroopers are largely identical to standard stormtroopers except they have additional training in specialized areas. Their armor consists of an 18-piece anti-blaster cocoon shell with heat-reflective coating worn over a temperature-control body glove. The sandtrooper helmet features automatic polarized lenses, a built-in comlink and breathing filters. Though a desert is, by technical definition, any area devoid of significant moisture, these stormtroopers are specifically designed for high temperature environments. As such, these soldiers have also been dispatched to hot, wet, tropical terrain operations since their cooling units and sealed water systems are easily modified to cope with such areas. Instead of depending on machinery that may not function in hostile environments, sandtroopers make use of local creatures for transportation. The specific detachment dispatched to Tatooine was the Desert Sands unit, led by senior officer DSS-0956. These elite soldiers had training that emphasized independent thinking. 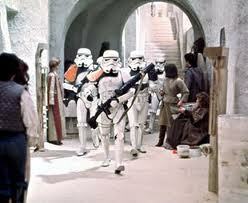 All Desert Sands stormtroopers carried heavy blaster rifles, long-range comlinks, and food and water packs. Sandtroopers wear colored pauldrons as a designation of rank. A stormtrooper sergeant's pauldron is white while an enlisted stormtrooper's pauldron is all black. Squad leaders, who lead units of seven troopers, wear orange shoulder pauldrons. Though many guides list this armor as specifically used by desert stormtroopers, several sources depict the backpack and shoulder pauldrons on high-ranking members of regular stormtrooper units.